Whenever you see a palm tree, what do you reckon? A vacation or a tropical paradise? We often associate palm trees with summer vibes, relaxing vacation, and the white sand beaches because we always see this kind of tree near the shoreline. Imagine yourself making a hammock between two palm trees while looking beyond the night sky and into the universe. What a nice way to relax right? 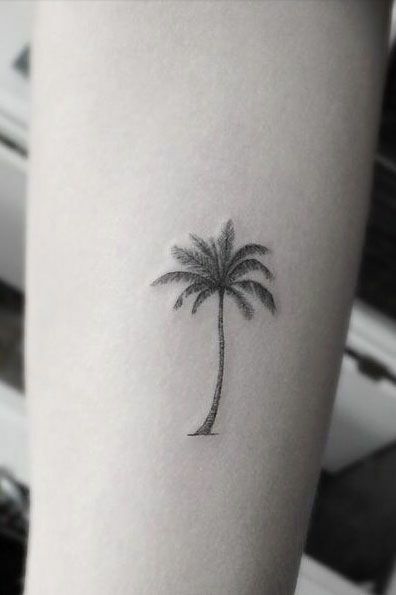 Since its already summer in your favorite tropical paradise, what better way to show your vacation but with a palm tree tattoo? 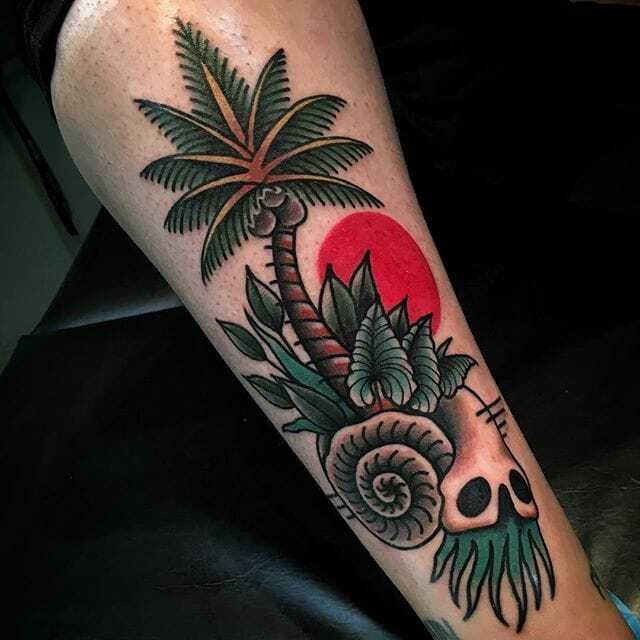 In this article, we will be discussing the meaning behind a palm tree tattoo as well as the body placement and designs that would be the perfect representation of your scream of summer. 1 Do Palm Tree Tattoo Designs Have A Meaning? 2 Where Can I Place My Palm Tree Tattoo? 3 Men vs. Women: Who Prefers Palm Tree Tattoos? Do Palm Tree Tattoo Designs Have A Meaning? Surprisingly, yes, palm tree tattoo designs do have a meaning although it differs from person to person. 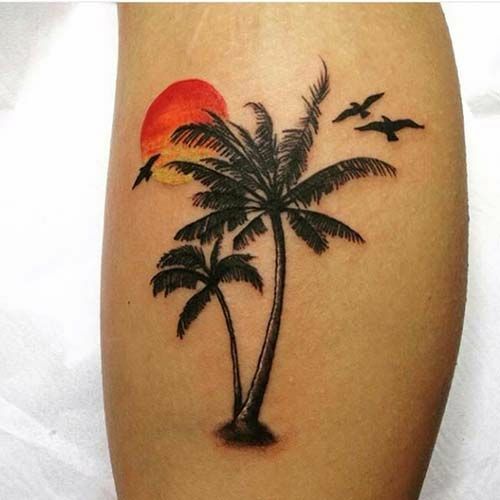 Oftentimes, especially in non-tropical countries, people get palm tree tattoos to remind their selves of relaxing time on the beach while sipping cocktails and talking with friends. Others however also say that since the palm tree is named the tree of life due to its various uses like oil, lumber, food, and décor, the meaning of a palm tree tattoo is versatility and adaptability of one’s character. A smaller minority also argue that the meaning of a palm tree tattoo is deeper than versatility of character. Since palm trees are very flexible, during storms, most trees that are strong and firm fall down due to the strength of the wind. Palm trees, however, can withstand the storm’s mighty gust. With this is in mind, it can be said that the meaning of a palm tree tattoo is strength and “man standing”. These are just a few of the interpreted meanings of a palm tree tattoo. There are many more out there that awaits to be discovered. Where Can I Place My Palm Tree Tattoo? The fun thing about this tattoo aside from the fun and relaxing beach memories it brings is that it is an adaptable tattoo meaning that it can be placed in numerous parts of the body. One can place it on his or her limbs which is the popular body placement choice for this kind of tattoo design. You can also have this tattoo inked on your sleeve and rib area if the design you have in mind is more complex and in need of more space than what your limbs can provide. Men vs. Women: Who Prefers Palm Tree Tattoos? It is funny for you to ask this question, especially in the current day and age. 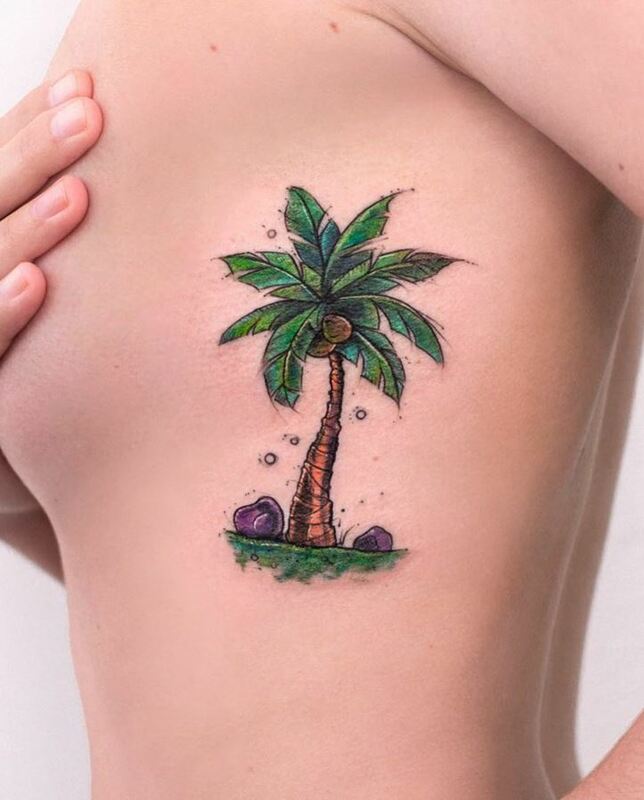 There is no proper statistical data to tell whether men or women prefer this tattoo design but from what we can see on the web, palm tree tattoos have equal footing on both men and women with a slightly more preference on women. No matter the gender preference of this tattoo design, we are absolutely sure that you will rock this palm tree tattoo. There are various ways to interpret a palm tree. 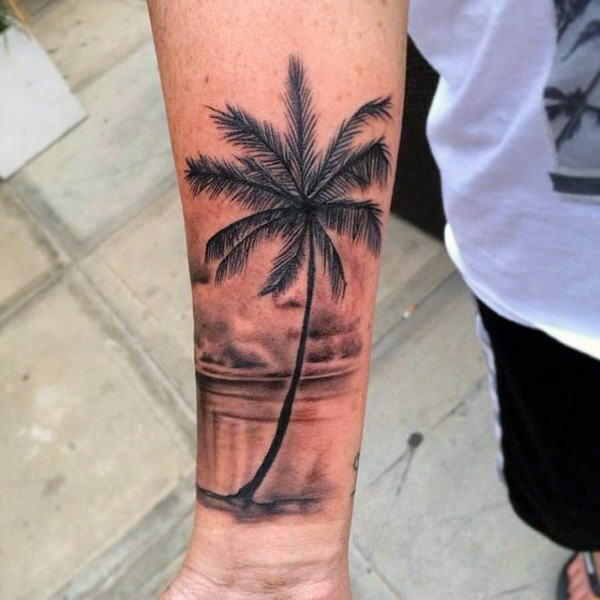 The most common of all designs is a palm tree silhouette tattoo that is only comprised of black ink. Watercolor tattoos of palm trees are also common. 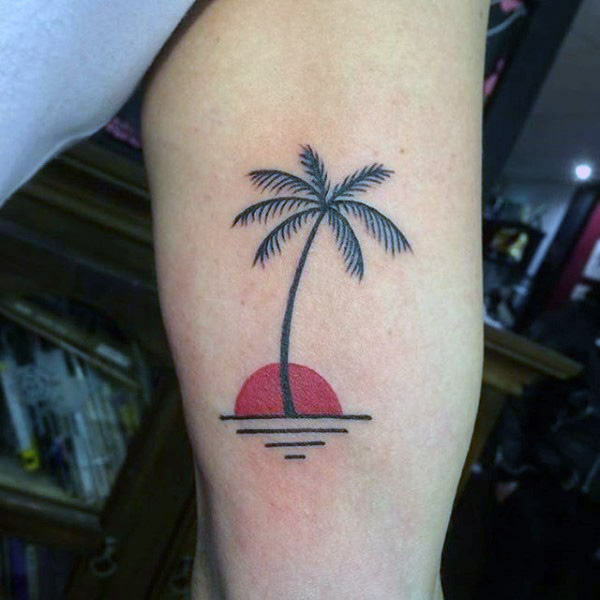 These tattoos often depict a colorful palm tree with the sun setting in the background. Here are some ideas for your next palm tree tattoo design. 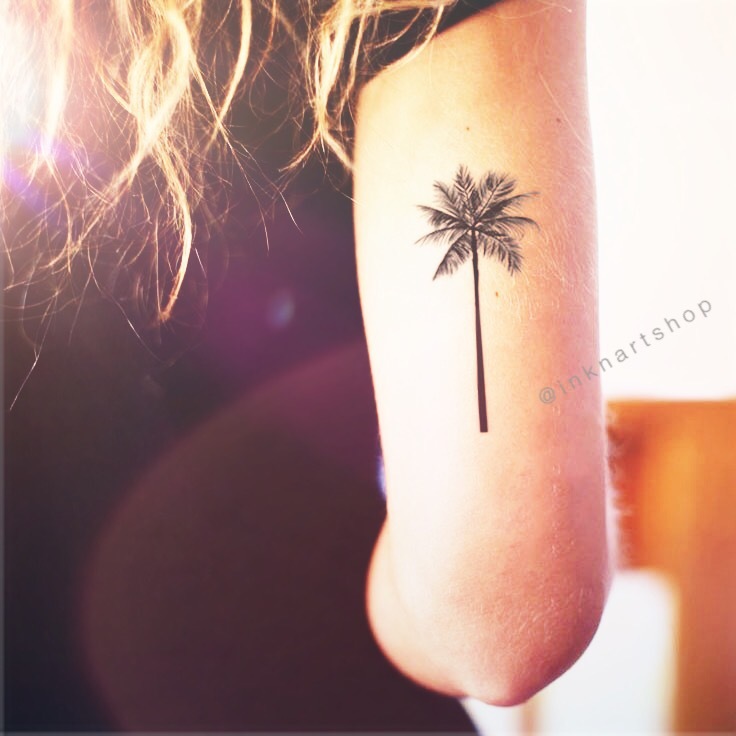 A small tattoo of palm trees on the wrist. 2. 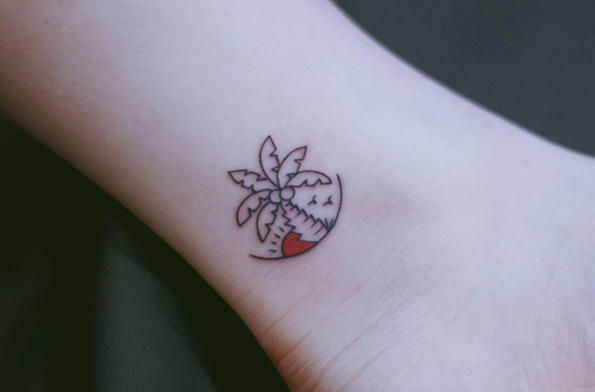 A small cute palm tree tattoo on the ankle. 3. A simple yet highly detailed ribcage tattoo of a palm tree. 4. A colorful ribcage tattoo of a palm tree with coconuts. 5. 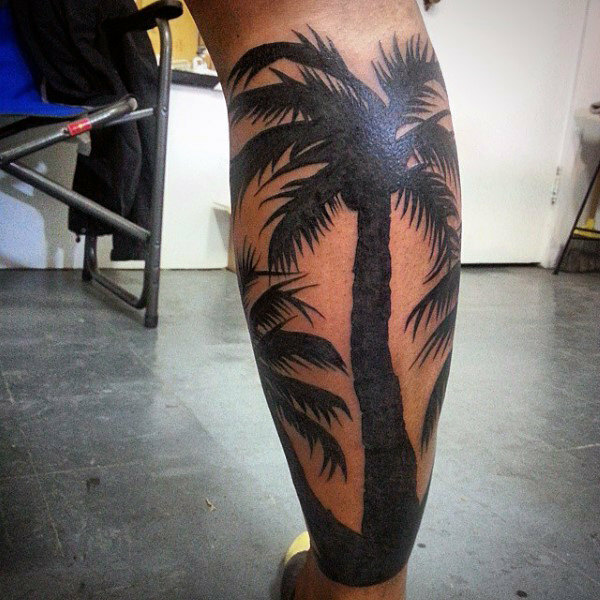 A shadowy leg tattoo of palm trees. 6. 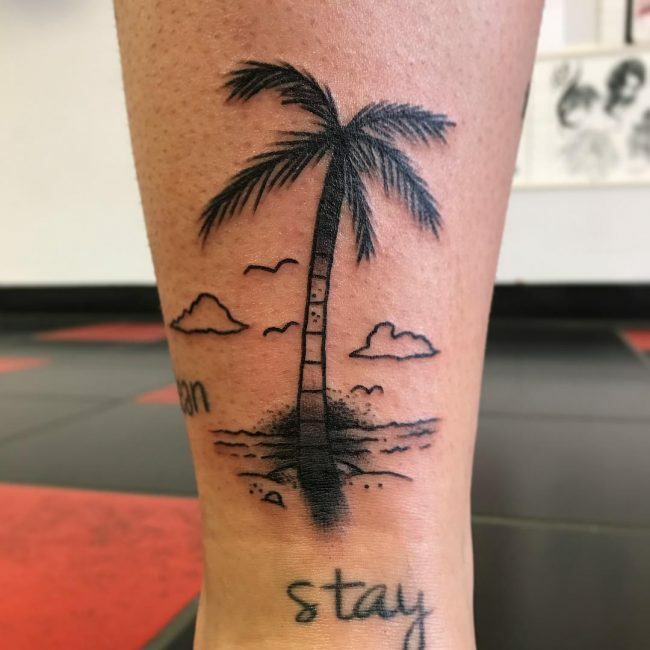 A simple palm tree tattoo on the leg. 7. 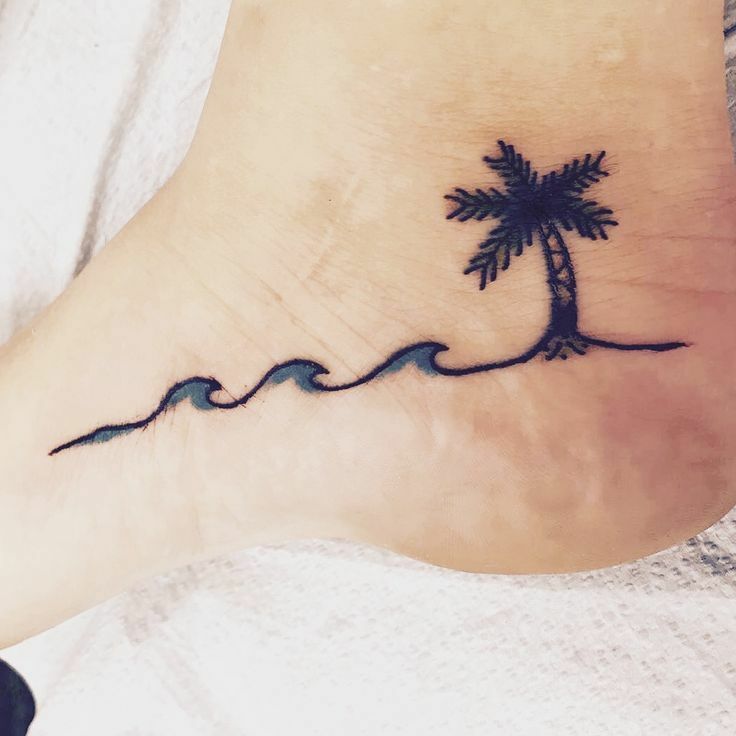 A small cartoonish foot tattoo of a palm tree on the shores of a wavy beach. 8. An arm tattoo of two palm trees while sunset. 9. 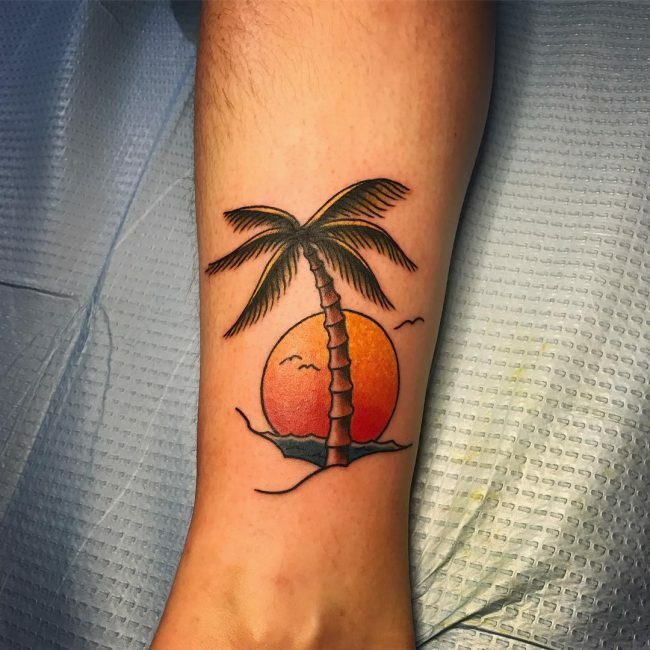 A watercolor tattoo of a palm tree while in the sunset. 10. 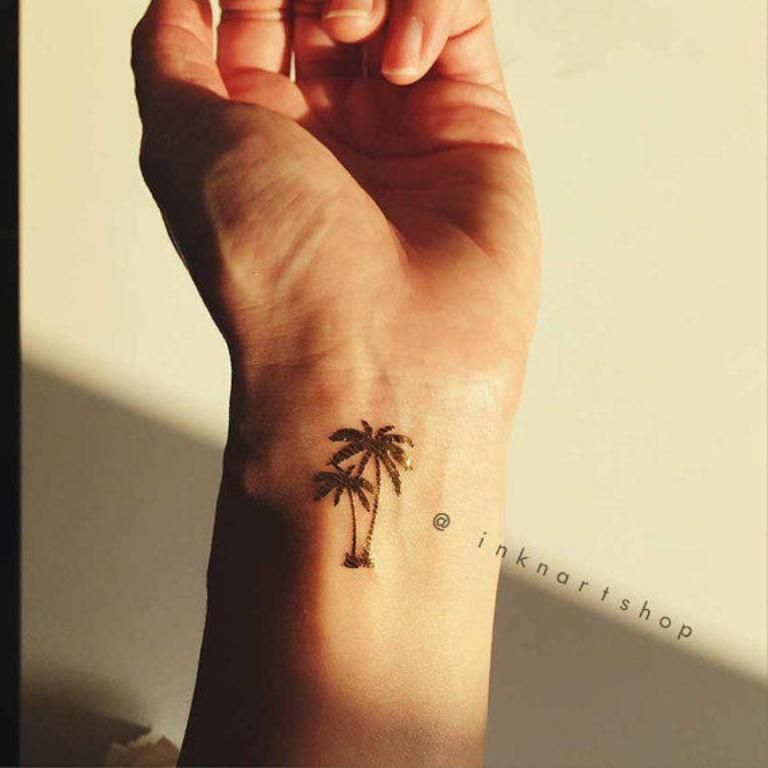 A minimalist palm tree tattoo on the arm with a sunset. 11. 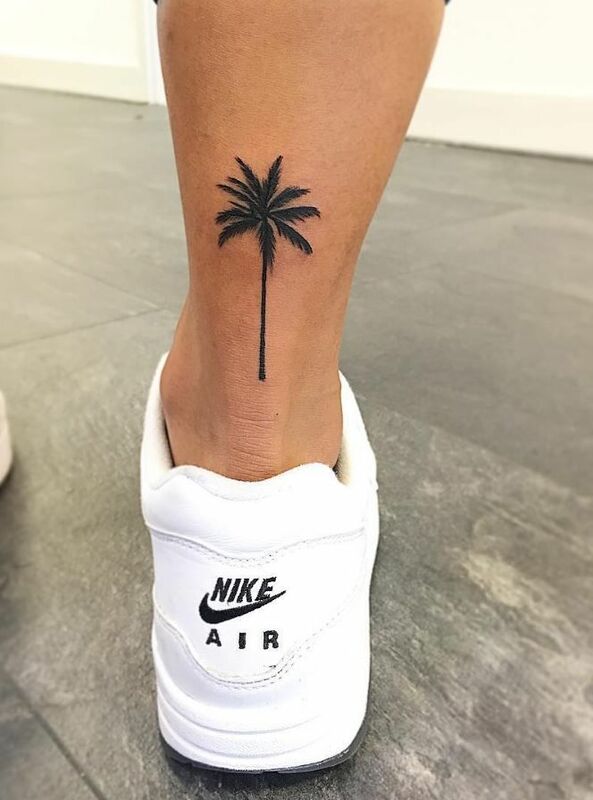 A small cute palm tree tattoo on the ankle. 12. 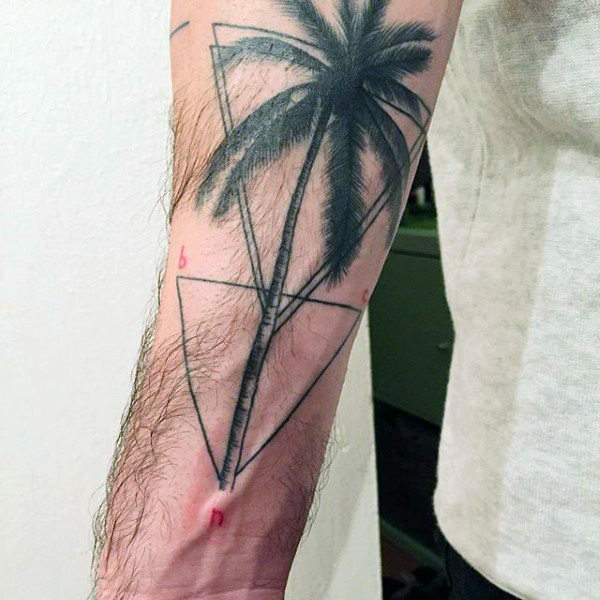 A palm tree arm tattoo with triangular embellishments. 13. 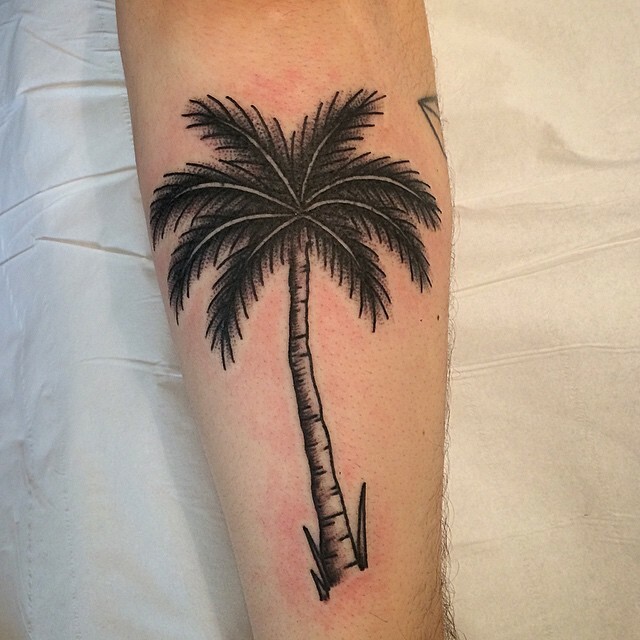 A cartoonish rendition of a palm tree tattooed on the arm. 14. 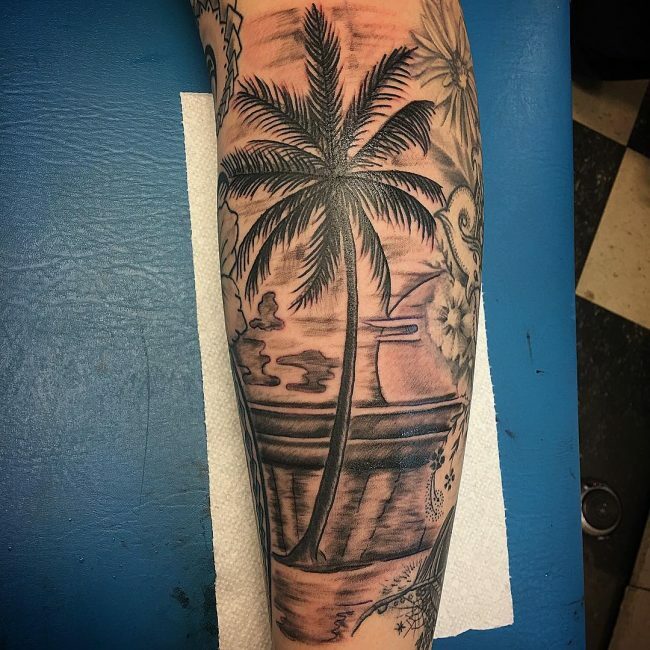 A detailed tattoo of a palm tree with cloudy skies. 15. 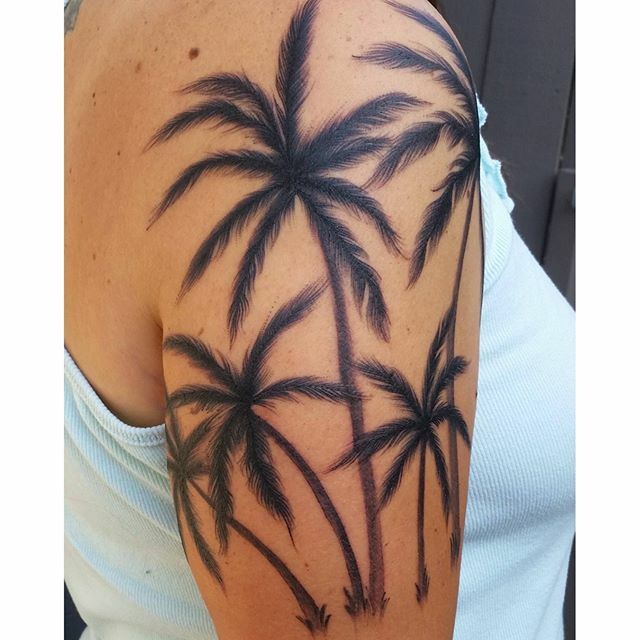 A large sleeve tattoo of palm trees. 16. 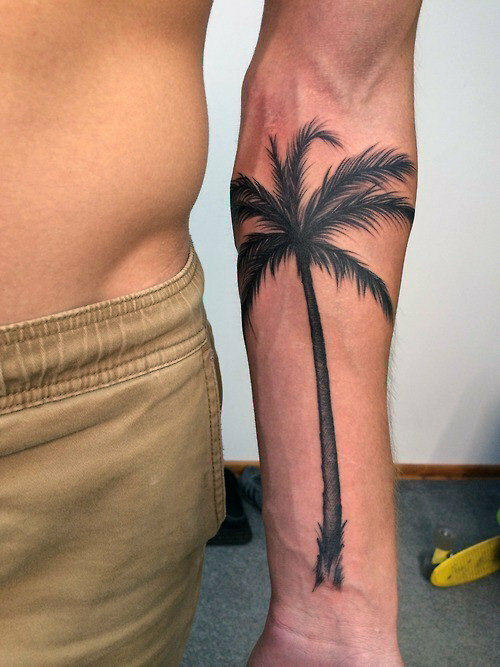 An intricate arm tattoo of a palm tree scenery. 17. 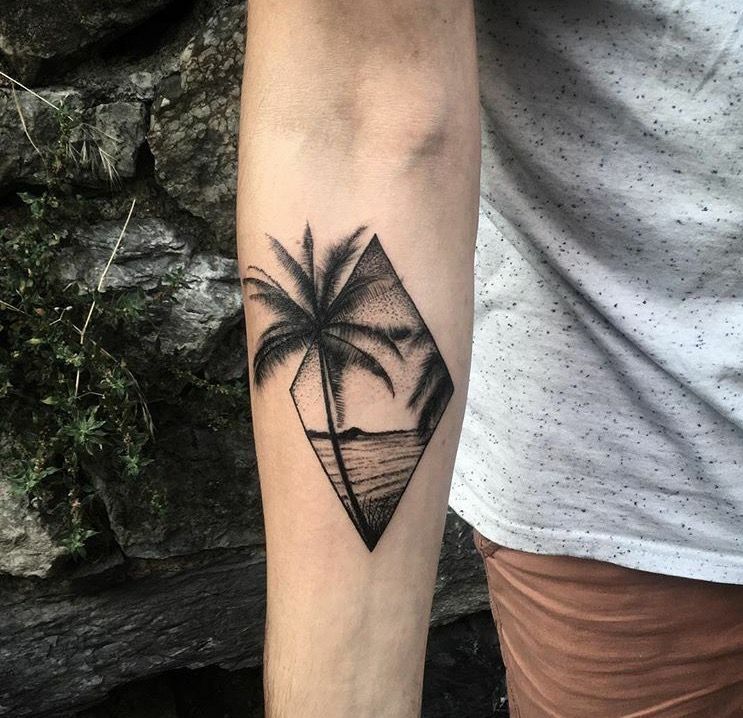 A framed scenery tattoo of a palm tree on the beach inked on the arm. 18. 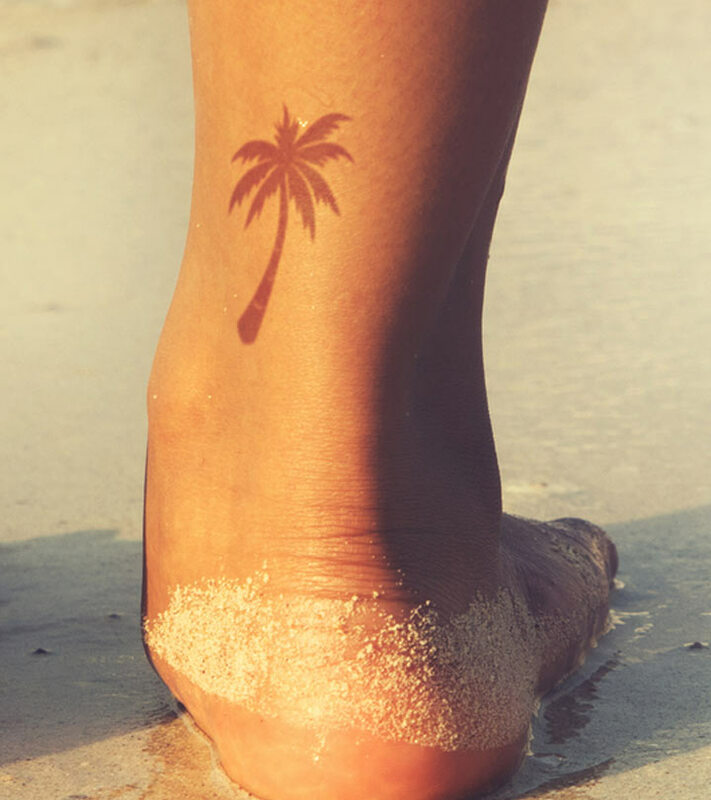 A silhouette-like ankle tattoo of a palm tree. 19. A small palm tree tattoo on the back of the leg. 20. Another small palm tree tattoo on the arm. 21. 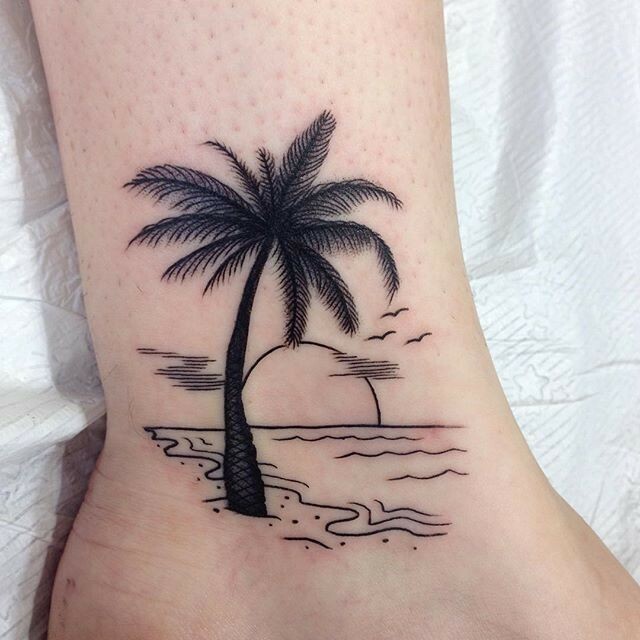 A drawing-like leg tattoo of a palm tree on a beach while sunset. 22. 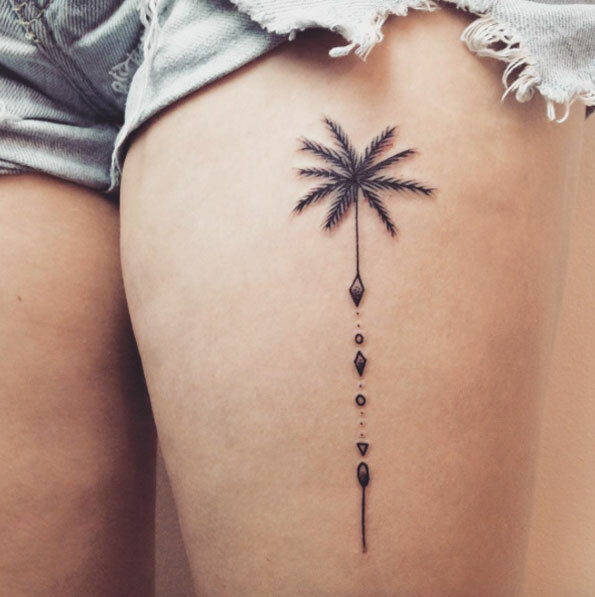 An artsy thigh tattoo of a palm tree. 23. 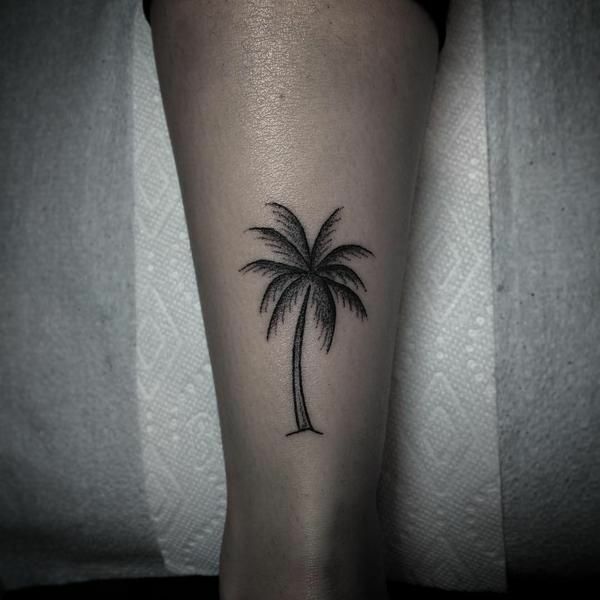 A small leg tattoo of a palm tree. 24. 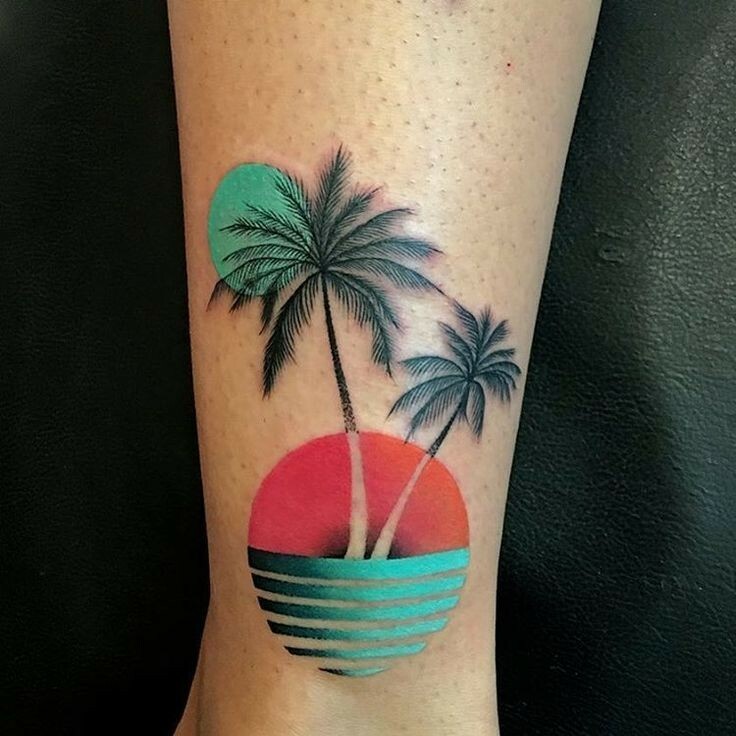 A retro-inspired colored arm tattoo of a palm tree with sunset. 25. A large detailed arm tattoo of a palm tree.